I definitely seem to be a on a book review roll and nothing makes me happier than the fact that I have been given the opportunity to read so many books! Because I do not have the space at my home (Once a kid comes into your life, every nook and corner is just filled with toys), I am actually filling up my office library by contributing the books. Speaking of office, me and my colleagues used to debate and discuss who writes mythology better...I would say Amish Tripathi and colleagues would say you have to read Devdutt Pattanaik and then decide. That's when I heard of the author, and since then was waiting to read one of his books and behold! I find 'The girl who chose' in my mail. 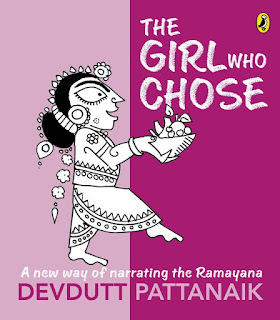 The girl who chose is a new way of narrating the Ramayana, the folklore that we have read about, heard about, seen on TV and what not. The book is actually for children, and hence has beautiful illustrations and large fonts, but young adults can definitely read it too. 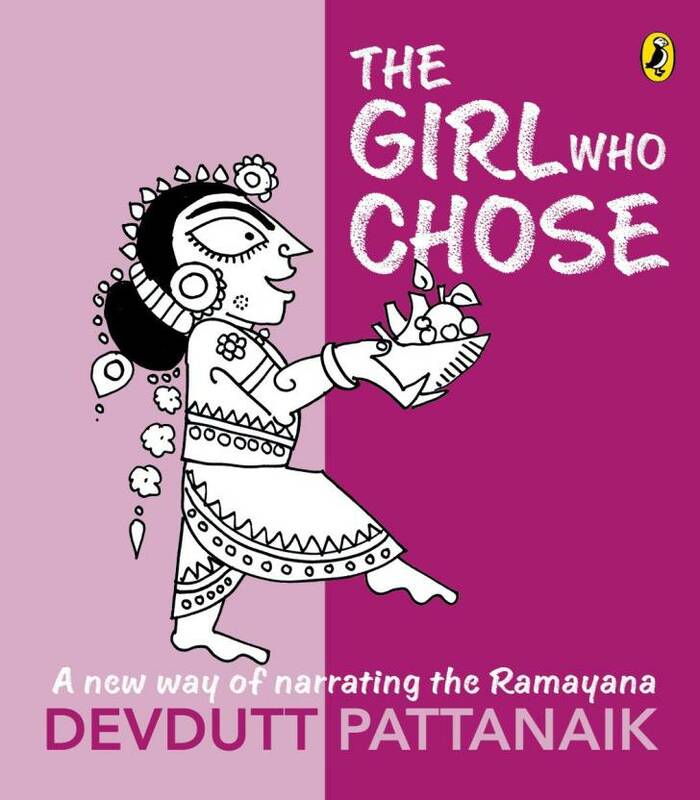 The book talks about Ramayana from Sita's point of view, of the five choices she had and what were the choices she made and the consequences that followed. The book also talks about the times when she did not have a choice and obeyed the rules made. Usually Ramayana is always visualised as Ram Vs Ravana and every other character is just a supporting role, but I love how Devdutt has given that a twist and also provided small bubbles of information on how other characters came to be and some information on their background or history. The book is not simply a tale being retold, the book goes much deeper into your skin and tells/reminds you of the Sita within you, within each one of us. If I spoke any further, I would give away the crux of the book and you would not enjoy reading it as much, so allow me to stop here and do get the book for your kid and read it yourself too, after all our memory isn't that great and it's always nice to brush through the story and remember the things that happen in the Ramayana. After reading the book, I remembered that I was never a fan of Ram really, someone who will follow the rules blindly even if it hurts himself or others whom he loves, I cannot really relate with him. Anyways, to read or to not, the choice is yours; choose wisely. Two thousand years ago, the poet-sage Valmiki wrote the Ramayana. It is the tale of Ram, the sun-prince of Ayodhya, who is obliged to follow family rules and so makes no choices. And of Ravana, king of Lanka, who does not respect anybody's rules or other people's choices.Over the centuries, hundreds have retold the tale in different languages, adding new twists and turns. But few have noticed that the tale always depends on the five choices made by Sita.What were Sita's five choices?India's favourite mythologist brings you this charmingly illustrated retelling of the Ramayana that is sure to empower and entertain a new generation readers. Devdutt Pattanaik is the author of over 25 books and over 500 articles on the relevance of mythology in modern times. He worked in the healthcare and pharmaceutical industries for 15 years before devoting all his time to his passion for decoding beliefs of all cultures, modern and ancient, located beneath the veneer of rationality. Extremely knowledgeable and exceptionally insightful, Pattanaik also boasts of the added skill of simplifying his mythological accounts into delightful reads that engage young readers. He is the master storyteller of the very popular Fun in Devlok series and Pashu. This review is a part of the Flipkart Blogger Review Program. I am taking my Alexa Rank to the next level with Blogchatter. Follow the journey using the hashtags #MyFriendAlexa and #JillOfAllTrades on twitter.